"I want to add to the success of YOUR next conference!" His presentations are so successful that they were featured every month for five years in CONVENE, the magazine of the Professional Convention Management Association. 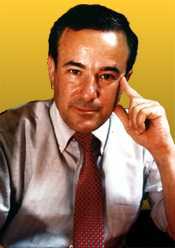 Currently, he is the on-line columnist on Lifelong Learning at ABOUT: The Human Internet (About.com), one of the ten largest U.S. websites. Conferees regularly rate the "ROI" of his presentations at over $1,000,000. 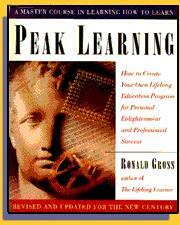 Ron's best-selling books include the classic PEAK LEARNING, just re-issued in a Millenium Edition. Formerly with the Ford Foundation, Ron currently heads a leading professional services firm, and chairs the prestigious University Seminar on Innovation, at Columbia University in New York. "Accelerating change demands that we all become lifelong learners" , says Alvin Toffler, author of Future Shock. "Ron Gross shows us how!"